Argentina’s President Cristina Fernandez de Kirchner has criticized her country’s elite for trying to create a negative image of her government. “These small sectors have done well through history, they have kept the lion’s share,” Cristina Fernandez said in an interview with state television. The president added that most Argentines are better off now than when she came to power. “Argentina is growing by 5% a year in a world that is collapsing,” she said. She accused the country’s media of misleadingly “creating an image people believe in”. 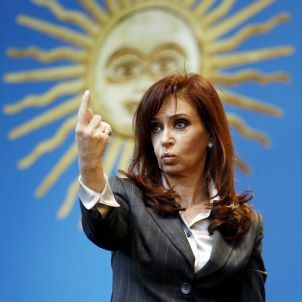 “Many want to go to back to the Argentina of the past, where labor cost was much lower and profit margins from speculation much higher,” Cristina Fernandez de Kirchner told Television Publica. Cristina Fernandez de Kirchner’s government had reduced unemployment and raised the standard of living, she said, through successful development and growth public policies. She said Argentina’s transformation began when her late husband, Nestor Kirchner, took office as president in May 2003. Nestor Kirchner took over a country recovering for the financial collapse which culminated in street riots at the end of 2001. Argentina enjoyed several years of strong economic growth during his government. Nestor Kirchner was succeeded by Cristina Fernandez, who was first elected in 2007 and re-elected in 2011 with 54% of the vote. But her popularity has since declined, according to opinion polls, and protesters have taken to the streets to denounce widespread corruption and high inflation. Cristina Fernandez de Kirchner has also had a difficult relationship with the country’s media. Under her government, the Congress approved a new media law that critics say restricts freedom press. She also introduced tighter regulations for Argentines attempting to buy foreign currency. In her interview with state television, Cristina Fernandez de Kirchner said the measure was necessary.